Venture philanthropy is a fast growing global concept and yet such a large proportion of the world is still unclear as to what venture philanthropy entails. Venture philanthropy, in a nutshell, is investing in a social venture using non-financial and/or financial means to help them become self sustainable with the ultimate goal of promoting social good. 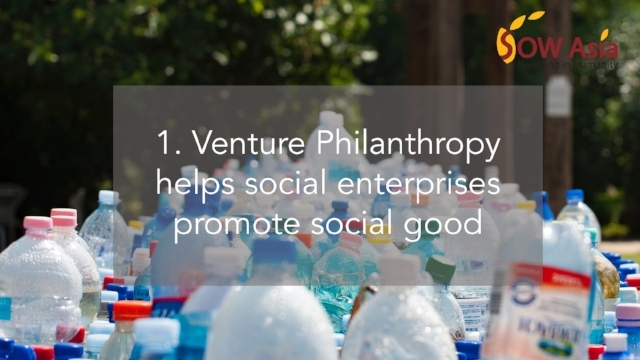 Venture philanthropy generally focuses on building capital and scale for social enterprises through providing funding, mentorship, consultation, and networking services and is a growing concept in Hong Kong. What is a social venture/social enterprise? A social venture/social enterprise is a business with the primary objective of promoting and encouraging social good through the use of market mechanisms. They are different from other corporations because their social goals are embedded within their business objective. For example, Hong Kong Recycles, one of SOW Asia’s entrepreneurs, provides systematic recycling collection to ensure that recyclables do not end up in landfills. In this way, they are providing a business service to decrease time spent on trash, as well as decrease the amount of waste produced by retail stores, offices, schools and other customers. You will see a lot of venture philanthropy websites telling you to apply for their accelerator programme, or apply to be in their incubator programme. And very often, if not always, the two terms are perceived as having the same meaning. Although mostly used together, there are slight differences between the two. The incubation process is typically for social enterprises which are at their ideation or early thinking stage. It specialises in growing new and early-stage businesses. It is at this stage where venture philanthropists support these social ventures or even single entrepreneurs with resources such as guidance, resources and funding opportunities to grow and amplify their impact. Fernando Sepulveda from Inc.com views incubators as a tool for the ‘childhood’ of a startup, whereas accelerators can guide ‘entrepreneurs from adolescence to adulthood’. Acceleration programmes are aimed at social ventures who have the potential to scale their impact. Venture philanthropists support these social enterprises with mentorship, strategic planning, networking and usually concludes a pitch even where their innovations are presented to a panel of investors and media presence. 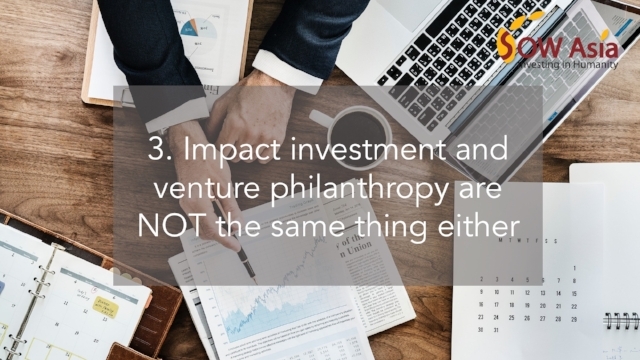 There may be many parallels drawn between impact investing and venture philanthropy but there are several differences. Impact investing can be described as ‘mobilizing large pools of private capital from new sources to address the world’s most critical problems’. It has the dual aim of causing positive social and/or environmental improvements whilst making a profit. For example, investing in a company such as Tesla Motors Inc. would be a form of impact investing because the company has used innovative ways to reduce the carbon footprint in their supply chain. Venture philanthropy focuses more on impact measurement and management as opposed to funding organisations and individual projects. 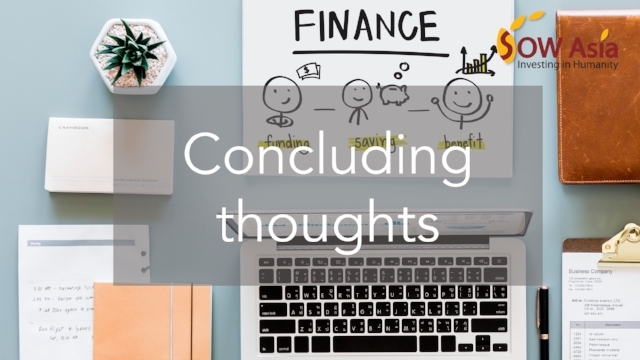 Their primary goal is to support and improve systems and sectors through a range of financial instruments and tailor them to the needs of an organisation. There are also focused more on capital building rather than making a profit. Each venture philanthropist will tailor its accelerator and incubator programmes based on what its primary social issue focus is. Each venture philanthropist accepts start-ups at different stages and as much as it is the venture philanthropist’s goal to help social enterprises scale their impact, it is also the social enterprise’s duty to find a venture philanthropist that is tailored to their business goals and ambitions. Stay tuned for SOW Asia’s new cohorts to see if we can help your social enterprise grow!